Length Overall: 107.5 cm. Blade: 89 cm. Condition Excavated, with mild to moderate pitting. As is the case with so many medieval European swords, this weapon does not just snap right into place within Oakeshott's system of classification. The grip length of 12.3 cm. is longer than would be expected for a sword intended exclusively for use with one hand, though not fully to hand and a half length, and the moderately long blade shows very little taper for the majority of its length. These features and the long crossguard, by silhouette, suggest type XIII. However, the fact that the blade is relatively narrow at 4 cm. and has a narrow fuller which runs to 14 cm. from the tip, or just over five-sixths of the blade length, would be more consistent with type XI. A greater degree of taper would be expected with types XII or XIIa, which otherwise would be attractive possibilities. 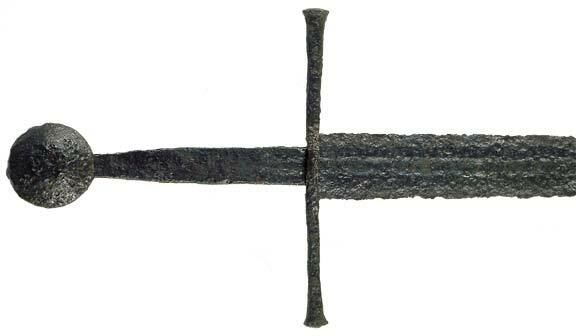 The long iron crossguard has a square cross-section and flares towards either end. The tang is robust and a trace of the fuller may be seen to fade moving from the crossguard. The 5 cm. in diameter iron pommel is of Oakeshott's type I, being a disc rising on each side in a conical fashion up to a central flat circular face. This differs from the classical wheel type pommels (types J and K) in that the conical portion of each face lacks the concavity usually associated with those types.